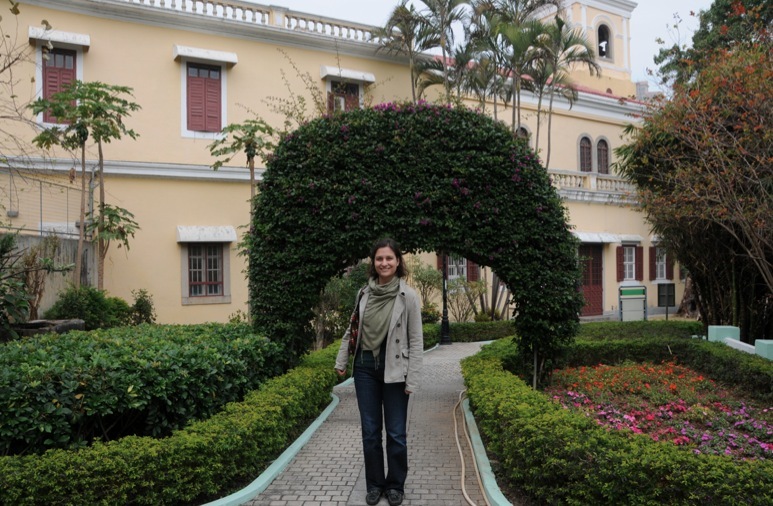 While we visited Macau we also travelled to the South side of the island to Taipa, which is an old, small village. 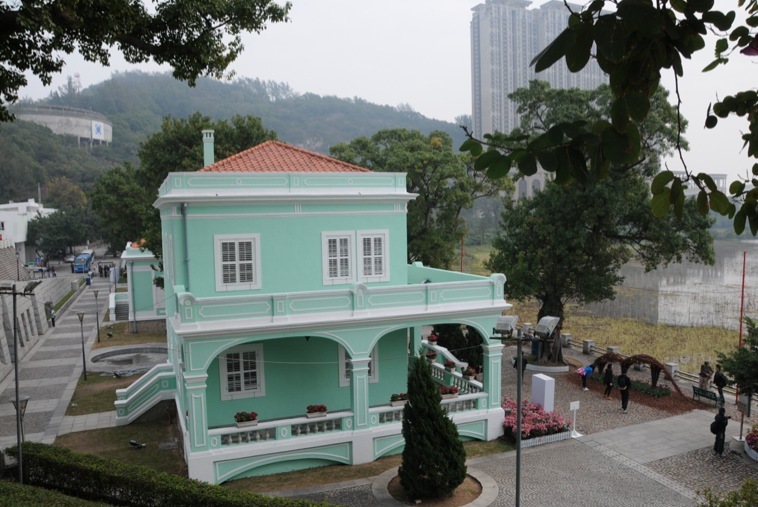 One of its main attractions are the Taipa Houses, a museum housed in a set of old houses. 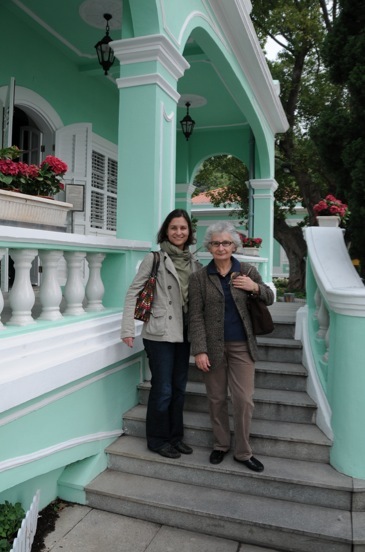 The five lime-green villas were summer residences built in 1921 by wealthy Macanese. Three hold permanent exhibitions, while the other two are used for receptions and special exhibitions. The House of the Regions of Portugal (Casa das Regiões de Portugal) has costumes and examines traditional Portugal. 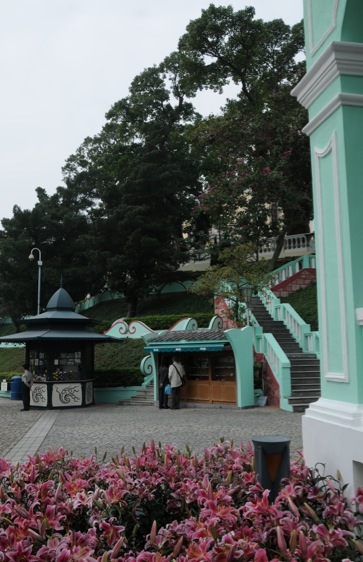 The House of the Islands (Casa das Ilhas) looks at the history of Taipa and Coloane, with displays devoted to the islands’ traditional industries: fishing and the manufacture of oyster sauce, shrimp paste and fireworks. 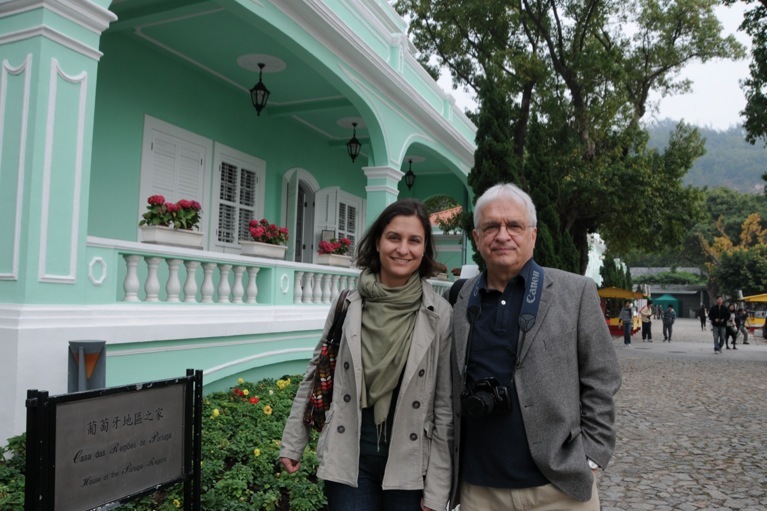 The last is the Macanese House (Casa Macanese), a residence in local style; it looks like the dom e doña (husband and wife) living here just left. 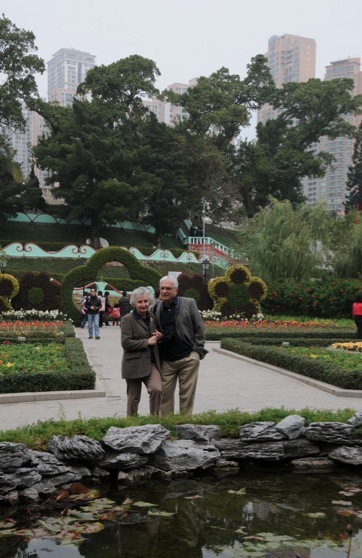 The furnishings – blackwood furniture and Chinese cloisonné with statues and pictures of saints and the Sacred Heart – offer a snapshot of life here in the early 20th century. 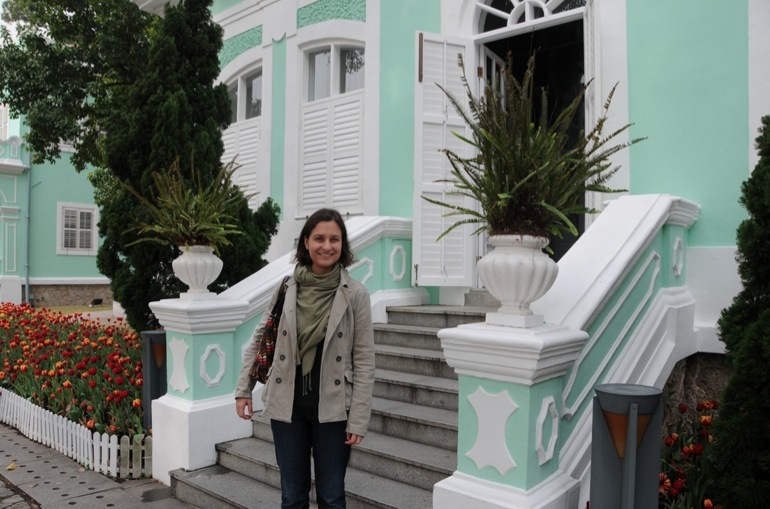 In the 80’s, the Tourist Department of Macau bought and recovered the houses. 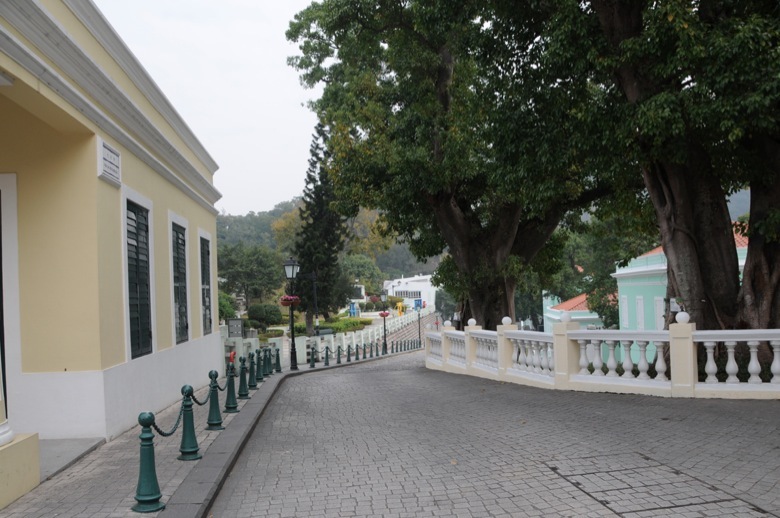 The government of Macau decided, in the late 90’s, to fully remodel the houses and turn them into the Taipa Houses-Museum. 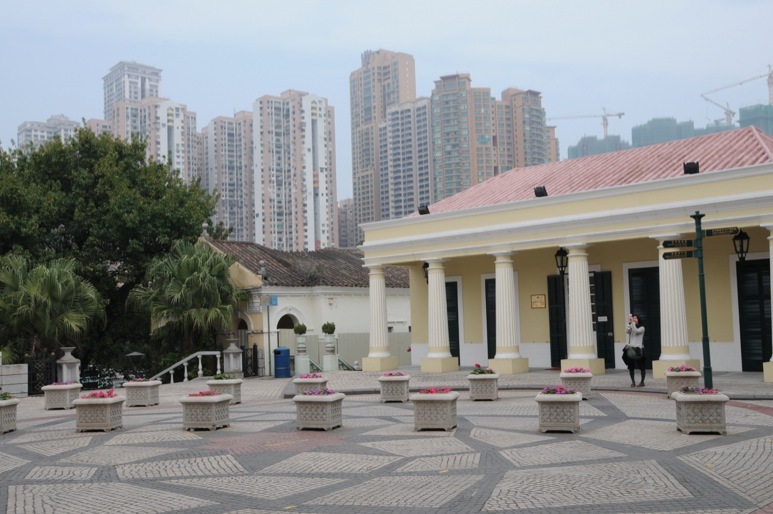 The houses used to look out over the sea, but due to land reclamation of the Cotai Strip between Taipa and Coloane, they are now next to a small lake. Still, it is nice to look at – especially as there was a lovely flower show at the time of our visit. 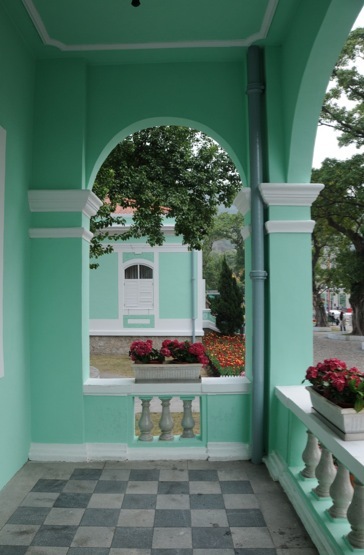 The garden is really lovely to look at – with the nice contrast between the lime-green villas, the yellow church and government house and the lush green gardens. But once you look beyond the little houses, you can see the skyscrapers and big casino and hotel buildings behind the small buildings – unfortunately signs of modern-day life.